Can Coastal Marine Fish Evolve to Tolerate Ocean Acidification? Noting that "assessing the potential of marine organisms to adapt genetically to increasing oceanic CO2 levels requires proxies such as heritability of fitness-related traits under ocean acidification (OA)," Malvezze et al. (2015) describe how they "applied a quantitative genetic method to derive the first heritability estimate of survival under elevated CO2 conditions in a metazoan." More specifically, they say they "reared offspring, selected from a wild coastal fish population (Atlantic silverside, Menidia menidia), at high CO2 concentrations (~2300 µatm) from fertilization to 15 days posthatch," which treatment "significantly lowered average offspring survival by 34% compared to control replicates," while after this assessment both perished and surviving offspring were "quantitatively sampled and genotyped along with their parents, using eight polymorphic microsatellite loci, to reconstruct a parent-offspring pedigree and estimate variance components." This work revealed, as they continue, that "genetically related individuals were phenotypically more similar (i.e., survived similarly long at elevated CO2 conditions) than unrelated individuals, which translated into a significantly nonzero heritability (0.20 ± 0.07)." 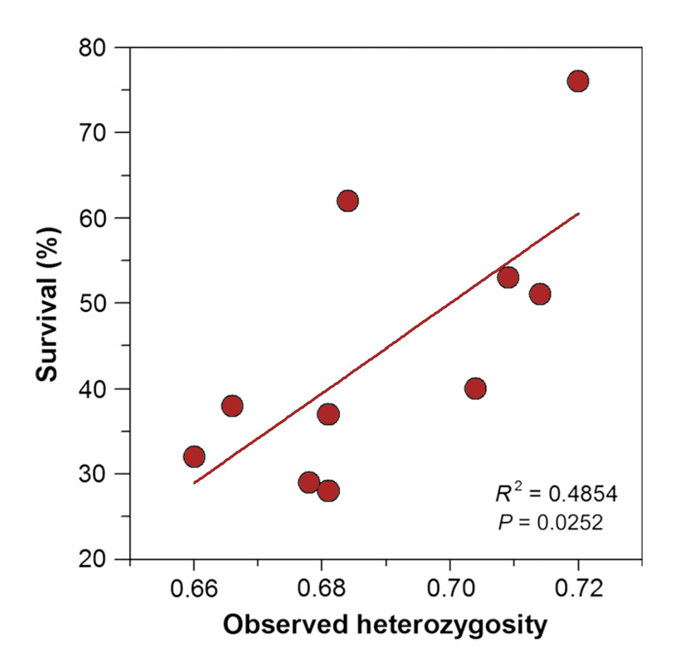 In addition, they report that "survival among replicates was positively correlated with genetic diversity, particularly with observed heterozygosity" (Figure 1, below). And they thus conclude that "early life survival of M. menidia under high CO2 levels has a significant additive genetic component that could elicit an evolutionary response to OA, depending on the strength and direction of future selection." Figure 1. Offspring survival of Menidia menidia 15 days post hatching at high CO2 conditions in relation to observed heterozygosity. Source: Malvezzi et al. (2015).